For those seeking to minimize their costs while getting a full featured email marketing system, MailerLite earns our highest rating. Click here for more information about MailerLite. Did you hear the news? There is a relatively new marketing tool on the market that’s definitely worth learning about. The marketing tool is called Mailerlite. So today, we are going to focus on reviewing Mailerlite, which is an effective web-based autoresponder system that is great for email marketing. There are many pros to using Mailerlite, some of which include sophisticated campaign types, simple forms and landing page builder, and in-depth reporting capabilities. Check out our comprehensive list of Mailerlite pros. We promise you won’t want to skip this section. One of the biggest selling points of the mailerlite autoresponder is the price, and let’s face it, who doesn’t love a good deal? Mailerlite offers an unlimited free plan that consists of many features from the premium plans for up to 1,000 subscribers. One of these great features is marketing automation. Just keep in mind that the free plan does not include access to live chat support, email click maps, newsletter templates, opens by location, customer HTML editor, delivery by time zone, custom domains for landing pages, or auto resend capabilities, so if you need these features, you’re better off going with one of the premium plans. Here are the pricing details of the premium paid plans. Compared to the competition, these plans are about half the price, so they are definitely the most affordable options on the market. Plus, if you pay for the plan every year, you’re eligible for an even bigger discount. The incredible features of this marketing tool definitely make it worthwhile. These are the most important features that you should know. Email Types: The types of emails that can be sent with this marketing tool include surveys, autoresponders, reoccurring newsletters, classic, data-based, and A/B testing. Editor: The editor is really easy to use and works smoothly. Creating columns with the editor is simple. Just use the “products” feature to create and customize the columns. The editor also enables you to include Twitter and Facebook posts in your emails. Personalization: Simple personalization is absolutely durable. There is also the option to use dynamic content blocks, which will only be displayed to groups/segments that you select. Opt-In/Opt-Out Process & Registration Forms: Many different types of forms are available such as embed, unsubscribe, and pop-up forms. Subscribe buttons are also available. A landing page can also be created from this section. Landing Page Editor: The landing page editor is truly a unique feature. The feature can be hosted by your domain or by Mailerlite. The landing page can be designed in the same way as the newsletter. Email Automation: Great email marketing is pretty much synonymous with automation. The good news is that the mailerlite email marketing tool offers a simple interface for easy automations. After setting your trigger, you can start creating workflows with steps that can be anything from updating a subscriber’s records, sending an email, moving a subscriber, or adding a delay. The possibilities are truly endless when using workflow automations with this tool. Reports & Analysis: Mailerlite offers general reporting capabilities, but there is no specific section for this feature. Ecommerce tracking is also available and Google Analytics and click mapping tags can be utilized. Bounce Management: After only one hard bounce or five soft bounces, your subscribers will be automatically placed in a bounce folder, and then you can manage them there. Integrations: There are quite a few integrations that can be supported with this marketing tool. Some integration options include Zapier, WordPress, and Shopify. Support: The email and chat options are extremely convenient, with the same representatives responding to your questions and concerns. Storage: There is an unlimited amount of storage available for data and images. Deliverability: The deliverability rate is 93 percent, which means that most of your emails will not disappear after you send them. Go ahead…breathe out a sigh of relief. List Management: With the list management capability, subscribers can be segmented by using an extensive array of variables. Template Designs: We have to admit that there aren’t a ton of templates available, but the ones the tool does offer look great, and they are extremely flexible. Authentication: Two-factor authentication is offered through the Google Authentication App. Languages: Mailerlite is currently available in eight languages, and the support is offered in five. Mailerlite is probably one of the easiest marketing tools to use, thanks to its logical structure and clean interface. Fortunately, most of the sections work quickly. There aren’t many cons associated with Mailerlite, but we believe it’s our duty to share some of the marketing tool’s flaws. After reading this review, would you associate Mailerlite with some of the big players in the email marketing industry? Our comprehensive mailerlite review shows that the autoresponder system provides users with a unique experience, offering many features that are definitely beneficial to a wide variety of professionals. We recommend this marketing tool to small businesses, solopreneurs, freelancers, and bloggers. Since the mailerlite autoresponder has a simple and intuitive interface, it’s also a great choice for people who are just getting started with email marketing. Of course, even the best marketing tools have drawbacks, right? 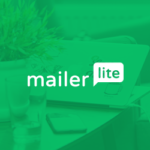 Due to the limitations of mailerlite email marketing, we do not recommend this tool for professionals who need complex automations and/or comprehensive reporting. We hope our mailerlite review helps you make an informed decision. Just remember that Mailerlite is one of the most affordable and effective marketing tools on the market, so if that’s what you’re searching for, you don’t have to look any further.